We made it across Colorado and Nebraska on the last Friday of vacation before coming to a merciful halt for the night at the In-Laws place in Omaha. Both the Elder and Younger Spawn got to play with their cousins for a bit and then we settled in for a Redbox movie night featuring Disney latest live action conversion, Beauty and The Beast. But anyway! Make money money money make money money make for the House of Mouse. What about the film? Was it good? Why, yes, it was. They had the option to open the movie with an old school overture (which we took) and I don't want to say it gave the movie 'gravitas' because that's the wrong word, but what it did do was make it seem like a play or a musical- and the some of the sets backed that up. In the opening song, ('Belle') when Emma Watson (who does a pretty good job singing. I dig it.) declaims that "she wants much more than this provincial life" she does so to a beautiful painting of the village below. The rest of the plot unfolds much like it's animated predecessor. Belle's father heads to town to sell things, get caught in a storm, harassed by wolves and eventually stumbled into the Beast's castle only to be thrown into prison. Belle goes looking for him and takes his place. Befriending the servants, she is treated to a spectacular dinner ("Be Our Guest") before wandering into the west wing of the castle, which the Beast has told her was off limits. Enraged, he scares her so much she flees into the woods and he has to rescue her from the wolves. A friendship begins as she nurses The Beast back to health- but in the meantime, Maurice makes it back to the village and enlists Gaston's help to rescue Belle, but when Gaston reveals that he's just doing it to get Belle's hand in marriage, Maurice balks and Gaston ties him to a tree to leave him for the wolves. Maurice is freed by Agathe (actually the Enchantress) and makes his way back to the village where he tells people what Gaston did. Gaston, being the gentlemen he is, convinces everyone that Maurice is crazy and needs to be thrown into an insane asylum. Belle meanwhile has a beautiful, romantic dinner with The Beast and when he uses the mirror to show her Maurice, she sees his predicament and The Beast lets her go, giving her the mirror so she'll have something to remember him by. She goes home and proves that The Beast is real and Gaston assembles a mob to go burn the castle to the ground. 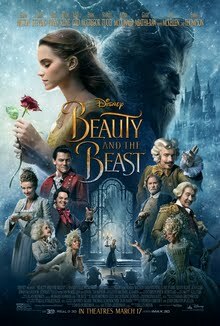 The final showdown sees Gaston meet his fate, the Beast die before Belle confesses her love, breaking the curse and restoring everyone to human form. If you've seen the animated movie, it's more or less the same thing. But, this movie actually dabbles a bit in developing characters a bit more. The fate of Belle's mother is revealed (Maurice was forced to flee Paris as his wife succumbed to the plague.) The Enchantress is more developed as a character as is Gaston and LeFou. The whole uproar of "the gay character" thing is much ado about nothing but all in all, it's a beautiful musical adaptation of an animated classic. All glory and honor to Emma Thompson as Mrs. Potts- but I don't care what anyone says, Angela Lansbury will always be Mrs. Potts to me. My Grade: *** 1/2 out of *****.